Laugh if you like; it looks like a holiday gimmick. We yukked it up when we received an early sample last year. But after a few weeks in the shop the truth came out: We argued over the sample and ended up heading to the store so we could each have one. This hydra-headed flashlight actually works — and simplifies work tasks by putting light where you need it. First the details: folded up and pointed forward, the 3-in-1 feels and functions like a good ‘ole barrel-shaped flashlight. Press any of the three power buttons and all three lights activate. Push a yellow stud on the bottom, though, and its three legs pop out, rendering the light stable on a garage floor or work bench. Now the fun begins. Each light individually swivels about 120 degrees — from pointing straight up to pointing about 30 degrees downward. You can create scores of lighting shapes by bending the three lights around. For example, you can plop the tripod on your workbench and point a light downward and across your work. Or you can stand it on the floor under the car and adjust each light separately so you can not only see what you’re doing but what’s happening because of it. 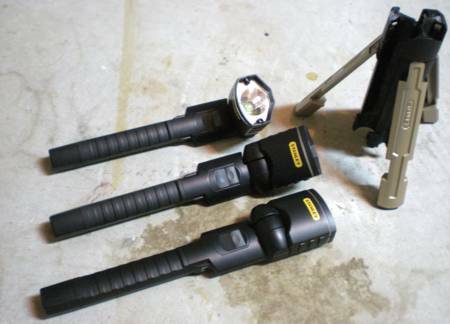 And though it doesn’t come up nearly as often as the examples above, you can also remove each of the three lights and carry them around separately as individual flashlights. The remaining lights continue to work together. Stanley put a little thought into this light as well: a small, clear plastic ring around each light head leaks light out the sides a bit, preventing you from accidentally leaving the light on after setting it down on its front side. As for durability, try this on: Sean owns one. He’s had it for almost a year now, and it still works. Considering how many of my flashlights he’s broken (and how he treats his), I’d say that’s test a-plenty. When you get one, prepare to spend hours making “lunar lander” noises every time you pick it up. 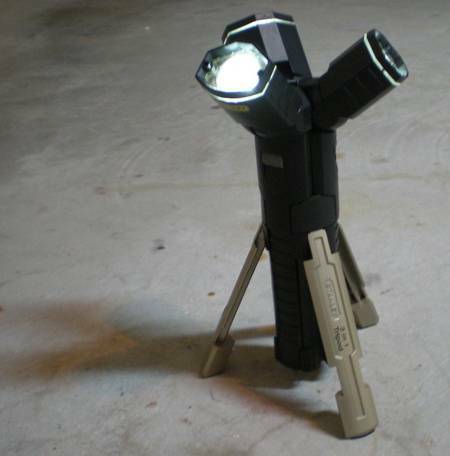 I don’t have this flashlight and prob would–if I hadn’t purchased the original Stanley Tripod light–it only has one light but it has the tripod and the head is adjustable. —What I liked about the original was that it had LEDs —-What I don’t like about it is that it has LEDs. It just isn’t very bright. So is this flashlight system bright enough? I have one of these and the smaller key chain version. Woot! sold two of these for $20+ with the key chain flashlights thrown in as a bonus. My buddy bought the deal kept one and gave me one. 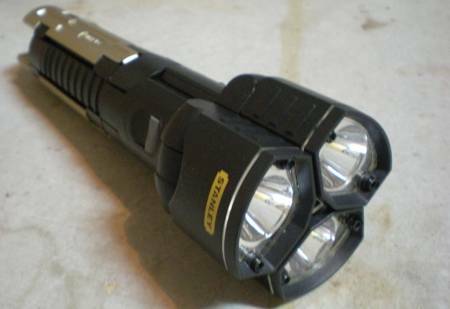 The flashlight is bright enough to get the job done in most cases and works great in a 360 degree situation to keep a room lighted enough to walk around. It’s definitely a keeper!